The trend is pointing up for the San Clemente girls’ lacrosse team. After winning more games in 2017 than the previous two seasons combined, the defending Sea View League champs roll into 2108 with enough confidence and experience to take a run at improving upon last year’s 15-4 record and perhaps playing a little later in May. An offense that averaged 13 goals per game last year may be even more potent this year. 2017’s top four scorers, seniors Jessica De Collibus (57 goals), Kiley Buckley (53 goals), and Shay Hefft (48 goals) as well as as sophomore Madison Buckley (17 goals) are all back in 2018. Midfielders Hefft and De Collibus join junior attack Delainey Iles (11 goals) on the All-County Watch List. When the ball is at the other end of the field, the Tritons will look to junior Kennedy Kingsmill and junior defenders Taylor Schulte and Catherine Yubeta to take leading roles in keeping the opposition at bay. All three are Watch List candidates. Kingsmill replaces the now graduated Veronica Petrikas between the pipes. Kingsmill saw enough action last year while recording a 6.0 goals against average to show that she is up to the task. The Tritons will begin testing themselves almost immediately by opening the season against three Top 20 teams: Los Alamitos, San Juan Hills, and Trabuco Hills. 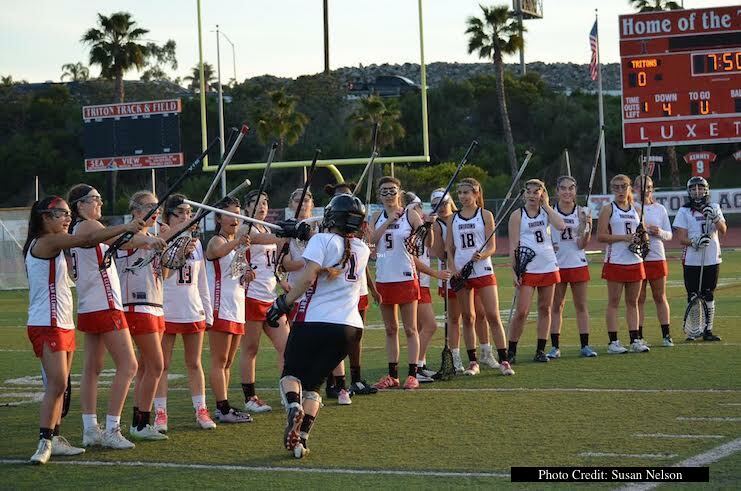 The season begins on February 24 when they host Los Al.